Signatures are an integral part of everyday processes. Purchase orders, travel authorizations, time off forms, patient intake, student permissions, new hire forms are all examples of routine everyday activities that require one or more signatures. Central Wyoming College serves Fremont, Hot Springs and Teton Counties. CWC is committed to supporting students through their educational journey and helping them achieve success. CWC wants to reduce their reliance on paper and sneaker-net processes. They saw significant value in streamlining their PO process which involves calculations, lookups and dynamic routing fixing a particularly error-procedure as a result. CWC selected frevvo to automate their PO process because of its modern look & feel, speed of implementation, ease of use and dynamic routing. As a result of the streamlined PO process, hours of staff time have been reduced and CWC staff can get back to focusing on students rather than administrative tasks. Mercy Ships, a global charity, has operated a fleet of hospital ships in developing nations since 1978. Mercy Ships follows the 2000-year-old model of Jesus, bringing hope and healing to the world’s forgotten poor. The organization was using Adobe LiveCycle forms or DocuSign and e-mailing documents around for signatures and approvals. However, as major browsers on desktop and mobile devices dropped support for the Adobe plugin, it was getting increasingly difficult to use. They decided to standardize on a single product that could handle forms, workflows and signatures. We wanted a single, affordable solution that would be able to address our forms, workflow and document signature requirements. frevvo’s modern, browser-based solution is easy-to-use, meets all our business needs at a reasonable price. Live Forms is the best web-based forms & workflow solution on the market today to address our needs. Mercy Ships selected frevvo Live Forms because it provided an easy-to-use solution that handles forms, workflow as well as signatures at an affordable cost. In addition, frevvo’s generous support for non-profit organizations and world-class Customer Success team have ensured a successful deployment. Mercy Ships has now automated 70+ day-to-day forms and workflows from HR to Volunteer processes with several more to be rolled out in the near future. Signatures are an integral part of approvals. For example, frevvo’s own Client Services Order workflow starts with someone here filling out order details. It’s then digitally signed so that the data cannot be modified. Then, it’s routed to the end customer. The customer clicks on a link in the notification email and reviews the order details (read-only). Once approved, he/she signs the order anonymously (no login required) just like signing on a piece of paper. The workflow is then routed back internally to frevvo for any further approvals and provisioning. It’s easy to do, fast and efficient. Check out the new video below (4m 30s). Electronic signatures in frevvo are incredibly flexible and easy-to-use. Contact us for more information or sign up for a free trial today and take a look at some of our approval workflow templates. This is a repeat of the webinar of December 10 in case you missed it. We’ve made a few improvements based on attendee feedback and look forward to an even better event. Join Nancy on this 45 min session to see how you can start implementing electronic consent in your school today. Schools routinely send paper permission slips and consent forms home for signatures. Busy parents routinely forget to sign them and send them in with their kids. And, teachers routinely chase down missing signatures or are forced to make disappointed students miss out. In today’s day and age with ubiquitous smart phones, it’s an insane waste of time and resources. With cloud-based E-Consent from frevvo, parents can view and sign electronically anytime, anywhere from any device. It’s amazingly simple and affordable. With cloud-based E-Consent from frevvo, parents can view and sign electronically anytime, anywhere from any device. It’s amazingly simple and affordable. Join this short (45 min) webinar to see how you can start implementing these game-changers today. 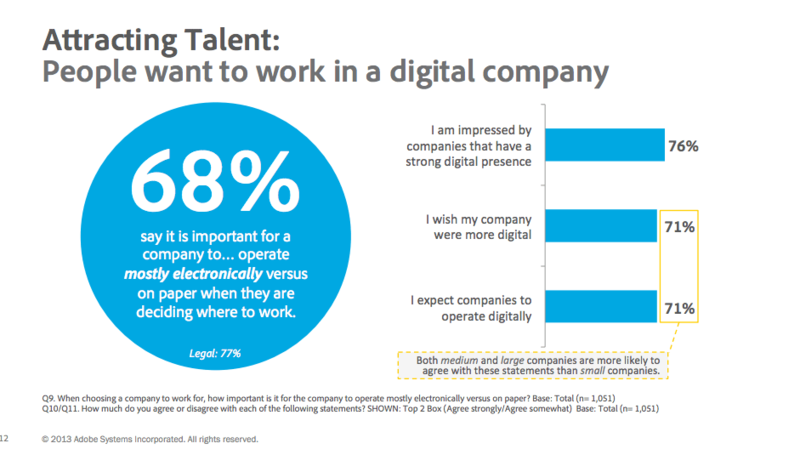 Adobe released an interesting study of US business managers views of digital processes and paper. The full study is here and it’s a year old but there are some particularly relevant and interesting nuggets, especially when it comes to collecting signatures electronically. By now, everyone knows that paper processes are expensive and inefficient (Getting a Purchase Order signed electronically) and just plain make you look bad (Google Apps signature form). But there’s even more to it than that. 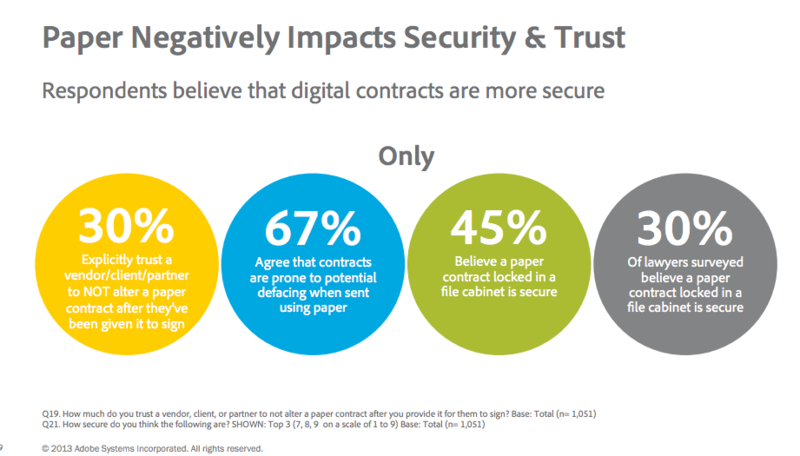 Users and customers increasingly trust digital/electronic signatures over paper. So not only is it costing you money, it’s making you look bad and not with the times. People are increasingly aware of the environment, care about it and understand the negative consequences of using paper. It’s one of the few concrete actions businesses can take immediately that are easy and affordable. In fact, going green by getting rid of paper saves your business lots of time & money. Old-fashioned, paper-based process just make you look bad not only to your customers but also to your employees. When we’re all carrying iPhones, who the heck wants to print out a Word document, sign it, scan it and email it around for approvals. It’s nuts! Automate your approval workflows with frevvo in the cloud, gain your customers’ trust, go green, attract the best talent and save time & money while doing it. What’s not to love? Contact frevvo today for more information. Are frevvo forms ESIGN compliant? An e-signature (electronic signature) is a simple, easy and legal way to sign or approve electronic forms/documents. Legal: They are widely recognized as legally binding around the world. Mature – Many Government agencies, Fortune 500 companies, and thousands of businesses use millions of e-signatures a year. Secure: E-signatures are usually far more secure than physical/faxed signatures. Forms and documents are securely managed throughout the process of gathering e-signatures. Auditable – The workflow is tracked throughout the process of collecting e-signatures from multiple parties. A digital signature is one specific implementation of an e-signature that uses digital certificates. Digital certificates are the key component of Public Key Infrastructure (“PKI”) and are issued by a trusted Certificate Authority. They provide a high level of security with respect to the transaction and the identity of the signer. Use the built-in security manager or integrate with external systems such as LDAP to authenticate users. Setup forms and workflows to allow configurable sets of authenticated users run-time access to forms and flows as well as the resulting submissions/transaction documents. Flexibly build custom prompts and text and display disclosure documents or language. Design dynamic forms and workflows that can react accordingly to user response. Include any/all consent responses in the transaction document. Require the signature to be entered each time (using a stylus or finger on a touch screen or a mouse). Store a user’s handwritten signature once and then use it automatically by the system to affix a handwritten signature under user direction. Capture handwritten signature images and store them along with the data that represents the electronic transaction (or send to a third-party system if that option is chosen). Protect all or some of the transaction document with digital signatures. The digital signature is applied simultaneously with the application of a handwritten signature, which is itself also protected with the digital signature. The accurate date and time of the signature is also automatically recorded and protected by the digital signature. Configure a transaction document with multiple sections, each of which may be protected with a digital signature requiring a handwritten signature from multiple parties to the transaction. The potential combinations available to designers are endless and very flexible. Immediately detect any tampering of the digitally signed data or electronic signature. Live Forms automatically checks digital signatures for tampering and immediately notifies users. Store transaction records within Live Forms or send data to 3rd-party systems. Live Forms includes several built-in connectors that facilitate this integration with no programming required. Provide access to the transaction document using the built-in repository. You may optionally allow read-only access to the resulting transaction submission to all parties or a subset of parties. Configure the system to create alternate formats such as a PDF that are stored with the transaction data and retrieved as needed. Store signature images along with the data that represents the electronic transaction and include them as part of the read-only data that may selectively be made available to parties of the transaction. The captured signature images may also be affixed to any generated alternate document forms (PDFs, etc.). Use built-in auditing to record who processed each step and when they did it. Make the audit trail available to all participants or configured for selective access by particular parties to the transaction. As you can see, Live Forms software provides everything needed to gather, track and store documents that contain legally enforceable signatures. If you’re interested in learning more, watch this 4 minute video on how to use e-signatures with frevvo Live Forms.